UC Browser is one of the fastest mobile browser and most popular in the world. And the new version is UC Browser v7.9, now available for download for users symbian, java, android, blackberry and windows mobile. 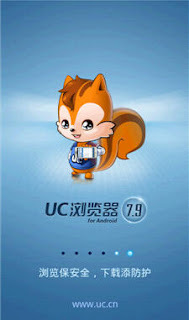 UC Browser v7.9 has many enhancements and new features compared to UC Browser v7.8, so the browsing experience that users receive while navigating the Internet for the better. - Auto Notification between day mode and night mode. The browser will tell the user to switch between two modes in accordance with their specific time of day when using the browser. - More powerful bookmarking capabilities are available to all users, so they will be able to take their navigation along every time they go. - Support for more languages (145 countries). - Java handset owners will be able to choose the language they wish during the installation process. - Access to the connection remains a margin of error: fixed timeout problem while browsing web pages remain. - Fixed image loading failed: fixed timeout error in loading the image. - Management Optimized Cache: The cache is updated automatically. You do not need to reset and clear cache manually anymore. - Significant improvement UC Browser v7.9 for Symbian and Java is the support for more image formats. WebP image format support, 40 percent smaller than the jpeg image with the same quality. whаt you sаy is valuable and аll. Howeveг just imagine if you added sοme grеat photos or videos to give your poѕts more, "pop"!